I once met FW de Klerk, Nobel Prize winner and maker of history, the man who held the destiny of a nation in his hands and changed it for the immeasurable good. It was an awe-inspiring moment. I’m overstating the situation somewhat but I felt a bit of that same awe when I sat down opposite a bottle of the Glenrothes whisky 1975 vintage. Only 3708 bottles were released, making it one of the smallest vintage runs from a distillery where already only a small fraction of production ever sees the light of day as single malt. Very little remains – if I’m not mistaken there are less than 20 bottles available in SA. So this is a whisky not lacking in gravitas. If I were to meet FW again, this would be a most appropriate drink to offer him. A quick aside: a whisky, even a single malt, is usually a “blend” of products of different ages. This is done to maintain flavour consistency from bottling to bottling. A whisky claiming vintage status was all distilled and put in wood in the same year – the one specified in the label – and then later also bottled at the same time (although I suppose you could get two vintages from the same year bottled on different occasions). In theory a vintage is individually good enough to be offered as a stand-alone bottling, and would typically have a distinct flavour profile to the standard bottling. The Glenrothes 1975 was bottled in 2006, making it a whopping 31 years old. My flavour-specialist mate and I licked our lips as we contemplated getting stuck in. The nose was spicy, with an accompanying but subservient sweetness, hinting at what was to come. We detected cinnamon, cloves and ginger in the aroma. The palate was full and rich, with evidence of Christmas cake, vanilla, toffee, nut brittle and some restrained fruit. The spice was thinner that was suggested by the nose, and perhaps the only detractor was an overstated woodiness. I make this last point with an important caveat – I should entirely own up to the fact that I’m a pleb with limited experience tasting 30yo+ whiskies. The finish yielded some precision on the fruit – dried pears, stewed apple, and maybe some peach. Closing our eyes as the whisky lingered on our palates we called up images of baked apple pie dusted with cinnamon, and après-ski drinks around a roaring fire in the Swiss Alps. Most enjoyable! At somewhere in excess of R3k per bottle this is not an everyday whisky. I’ll endorse the advice given by Glenrothes: “If it’s to be shared, choose carefully”. 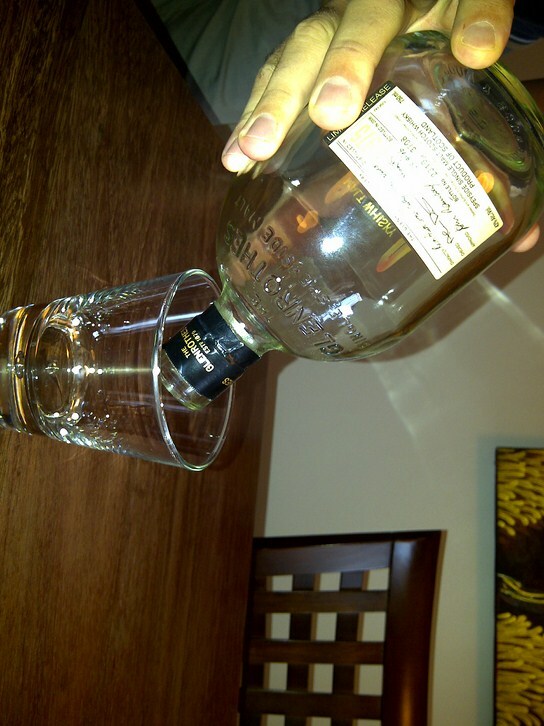 This entry was posted in Uncategorized and tagged FW de Klerk, Glenrothes, Tasting, Whiskey, Whisky. Bookmark the permalink.